Berkeley, CA â€“ 20 October 2011—Top Cow Productions is proud to announce the addition of acclaimed writer David Hine (THE BULLETPROOF COFFIN, Batman) to the stable of talented stewards of the Top Cow Universe. Beginning in March 2012, Hine brings his considerable experience to torturing one of comics’ favorite bad boys, Jackie Estacado. David joins Detective Comics creative partner, Jeremy Haun (ARTIFACTS, PILOT SEASON: THE BEAUTY) as the ongoing team on THE DARKNESS beginning with issue #101. Hine takes over the writing duties from the long time writer Phil Hester (Green Hornet, Wonder Woman), who has written the series since 2007, when the series relaunched following the events of FIRST BORN and the release of THE DARKNESS video game. Hine has previously written the titular character of Jackie Estacado in 2010’s limited series THE DARKNESS: FOUR HORSEMEN, which garnered rave reviews. With Hester concluding his run on the series with the landmark issue #100 and The Darkness II slated for release in February, the time was perfect for a fresh voice to embrace THE DARKNESS. The team of Hine and Haun will pick up the story of Jackie Estacado after the events of ARTIFACTS #13, which Top Cow promises will alter the status quo of the Top Cow Universe irrevocably. Joining the already announced teams of Tim Seeley (HACK/SLASH) and Diego Bernard (The Man With No Name) on WITCHBLADE and Ron Marz (MAGDALENA, VOODOO) and Stjepan Sejic (WITCHBLADE) on the ARTIFACTS ongoing series, the two will help guide one of Top Cow’s flagship franchises into a new era perfect for longtime, lapsed, and new readers alike. 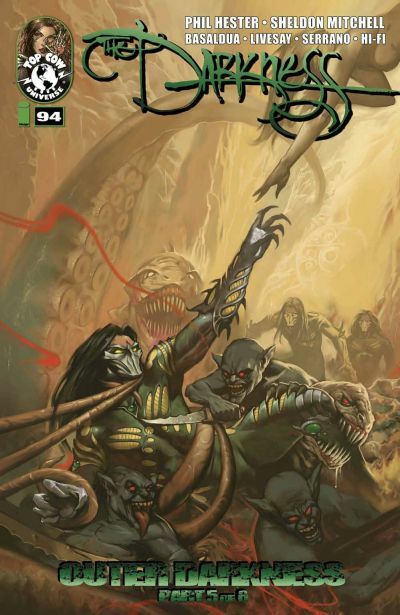 THE DARKNESS #101, a 32-page full-color comic book for $3.99, will be on sale in stores and digital platforms, including THE DARKNESS app, in March of 2012. THE DARKNESS #94 (APR110499) will be on sale October 26 for $3.99.